Little Zombies: The Donut Chef: Donuts...need I say more? 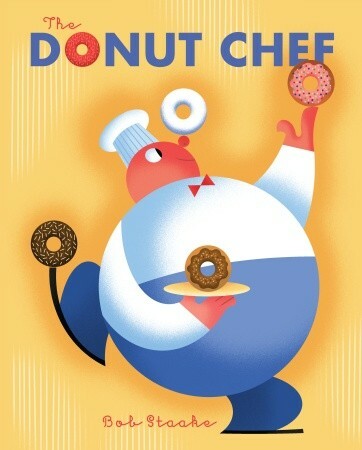 The Donut Chef: Donuts...need I say more? Rating: Must Read! Especially for donut lovers! IN THIS DELICIOUS tale, a baker hangs out his shingle on a small street, and soon, the line for his doughnuts stretches down the block. But it’s not long before the competition arrives and a battle of the bakers ensues. In the competitive frenzy, both bakers’ doughnuts become “quite bizarre, like Cherry-Frosted Lemon Bar, and Peanut-Brickle Buttermilk, or Gooey Coca- Mocha Silk!” Some are not even very tasty: “Donuts made with huckleberry (don’t be scared, they’re kind of hairy).” One day, Debbie Sue, just barely two, enters the bakery, and searches in vain for her favorite doughnut, where “the choice of donuts left her dazed. Said Debbie Sue, “But I want . . . glazed.” A fun lesson in keeping it simple in which our hero chef decides to go back to the basics, and wins over the whole town. Robot's Review: Oh this book is cute! And rhymingly delicious! And my son loves donuts (yes, me too). And this book does a great job of making you want more donuts! Where Is the Green Sheep? : Where are you?? Cam Jansen and the Secret Service Mystery: Click! Pop-Up Cards: Fun for all ages!